This sculpture is part of a series of large hollow infinity rings that I first created in 2002. The methods by which I construct my ceramic Infinity Ring sculptures were formulated after many years of investigating various processes. After many trials and errors, I have developed several different coil and slab building techniques to create three-dimensional clay continuums. Because the Infinity Ring sculptures sometimes collapse during the building process or implode while being fired in the kiln, their creation is both costly and time consuming. The continuum of planes that create this and my other Infinity Ring sculptures and jewelry designs are inspired by the Mobius Strip; a form first formulated by the 19th century German mathematician and astronomer, A. F. Mobius. The Infinity Ring form has no beginning and no end. The bottom side becomes the top side and the inside becomes the outside. Touch any point on the edge with your fingertip and trace its circular form. After completing a few revolutions you'll eventually end up at the point where you first started. The continuum form is also the same principle that Dutch graphic artist M.C. Escher used to explore infinity and the reversal of positive and negative forms in space. 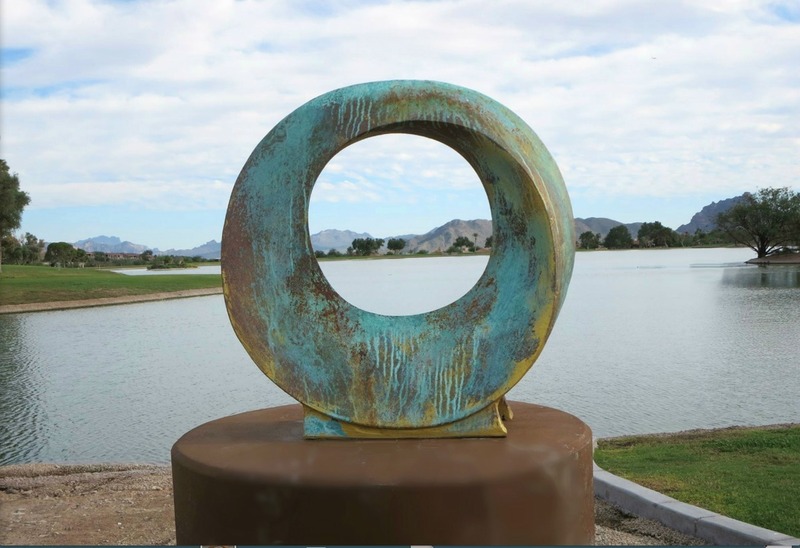 This sculpture is in the sculpture garden of Fountain Hills Park, in Fountain Hills, Arizona.